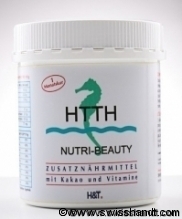 HTOS - FOR THE OSTEOPOROSIS AND DISORDER OF BONE MINERALIZATION. The causes of osteoporosis are multifactorial. We observed in this disease a displacement of the calcium mass of bone to connective tissue and the internal vessel wall. It attaches to other tissues! Provide the necessary raw materials in a usable form in order to improve the quality of the bone mass . Act in different types of calcium metabolism disturbances . Intestinal flora with prebiotics high value play an important role in the metabolism of various nutrients absorbed from the intestine, including calcium . The input weight ratio of components : Calcium , Potassium , Magnesium . These minerals are synergistic in their functions in bone metabolism . Boosting metabolic functions related to bone mineral uptake by silicon nettle fixed Ca, P , Mg and lives . D3 and regenerates cartilage , bone and tendon tissue . The presence of vitamin D3 is essential for the functioning of bone metabolism. Protein intake ( as conveyor minerals ) . Frame protein is somehow " iron concrete" of the bone, it gives him strength and flexibility . Endocrine causes and osteoblast senescence (decreased production of new bone cells ), with isoflavones from red clover. Along with taking the supplement, we recommend a reduction in the consumption of acid-forming foods (meat products , animal by-products , refined sugars, etc. . ) , Acidification opposing mineralization . Physical exercise , even light produced a stimulatory effect on osteoblast activity and nutrition by a skeletal blood flow in the muscles . Soybean extract, cereal extract, calcium glycerophosphate, fruit sugar, glucose, magnesium citrate, extracts of red clover and nettle. Vitamin C, vitamin E, vitamin D3, vitamin B. 1 tablespoon (approx. 10 g) in the morning to dissolve in a glass of water or to taste in yogurt or fruit juice for 2 months. 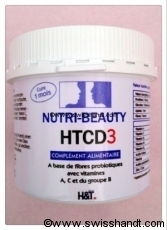 HTCE2 - FOR REGULATION OF INTESTINAL TRANSIT : constipation and diarrhea. Regulation of intestinal transit constipation and diarrhea. Our intestinal flora is composed of 500 to 1,000 species of microorganisms. It represents a total weight of 1.5 kg . Our intestine contains 10 times more microorganisms than the number of cells in the human body . The health of our "roots" : the intestines. - Bloating , intestinal fermentation. - Constipation and chronic diarrhea. - Alternating between constipation and diarrhea. - Inflammation of the intestine. Our style of "modern" life , our industrialized diet, our stress, our consumption of antibiotics and other drugs , our emotional disturbances are responsible for intestinal disorders and lower our immunity. The imbalance in our intestinal ecosystem (flora ) is nearly universal . Regeneration and balancing the intestinal flora through prebiotic fibers of high value . Prebiotics feed selectively beneficial bacteria in the intestinal flora . - Regulation of intestinal water balance. - Regulation of intestinal pH (essential for improving peristalsis. - Disposal pasted on the walls of the intestine. - Troubleshooting bloating and constipation. HTCE2 laxative is not and does not show interaction with potential drugs . Natural Remedy : Pre- biotic from soybeans ( non-GMO ) and pre-germinated wheat, obtained by micronization - 35 ° magnetic field, fruit sugar , grape sugar , vitamins of group B at 50 % of RDA. 1 tablespoon per day, treatment of 2 months. Diluted in a glass of water, soy milk or rice , fruit juice , muesli , yogurt, etc. . It originates disruption of metabolic order. It now affects a population of younger and younger . - Elimination of self -intoxication and inflammation of the colon regenerate the intestinal flora using prebiotics . - Correct deficiencies in polyunsaturated fatty acids Omega 3 and 6 (anti -inflammatory Omega 3). - Dispose of oxidative stress ( free radicals, Vitamin A , E, C ). - Decrease inflammation and pain . and detoxification of the body . - Overall improvement of the nutrition of the body. 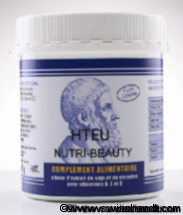 - Reduction of intestinal fermentation and bloating . - Improvement of the physical layout and mood . Prebiotic from soybeans (non-GMO) and pre-germinated wheat, obtained by micronization - 35 ° magnetic field, fruit sugar, grape sugar, cocoa (5.6%), vitamins A, E, C .
Diluted in a glass of water, soy milk or rice, fruit juice, muesli, yogurt, etc..
We now know that the top twenty neurotransmitters (" chemical messages " of nerve cells) are produced and stored by the chromaffin cells of the nervous plexus of the intestines hail. Along with the massive industrialization of our food , we are seeing an alarming increase cognitive dysfunction and learning disabilities . Unbalanced nutrition and micronutrient deficient consistently maintains the imbalance in our intestinal ecosystem (flora mucosa + + nutrients) . Therefore our intestinal nerve plexus called " second brain " between outstanding then it should work in harmony with the brain itself. Bad bowel condition causes disturbances such as impaired memory , learning and concentration difficulties. Act on the individual balance of intestinal flora by pre- biotic fiber high value . Pre- biotic selective feeders bacteria of the intestinal flora. The effect on the balance of microorganisms in the colon is critical. The bioavailability of nutrients is increased . The hydration and electrolyte balance are optimized . Our gut , particularly body manhandled by our modern lifestyle , is considered by some as our "second brain." This is not surprising when we know that houses more than 200 million neurons. Disconnecting the second with the first brain causes cognitive impairment. - Increase the capacity of intellectual concentration. - Decreased mental and physical fatigue. - Improved resistance to stress. Prebiotic from soybeans ( non-GMO ) and pre-germinated wheat, obtained by micronization - 35 ° magnetic field, marine collagen , fruit sugar , grape sugar , cocoa (7%) , evening primrose oil, autolysate marine fish (Omega 3), the B vitamins , vitamins ACE , with 50 % of the RDA . Diluted in a glass of water, soy milk or rice , fruit juice , mueseli , yogurt, etc. .
For women as for men , sick hair are a real concern aesthetic. External treatment proves most part of insufficient time . We must act from within. Indeed, the skin, hair and nails are the reflection of our health . Patients hair is thin , brittle , greasy or dry , devitalized . There was also a significant fall and dandruff. Wind, sun, pollution, harsh shampoos , perms, excessive drying age. Malabsorption of nutrients inducing micro- nutrient deficiencies (vitamins, minerals and other essential micro- ingredients). Depletion of liver reserves of sulfur amino acids essential to the formation of keratin which represents 95 % of the composition of the hair. Restoring the balance of intestinal flora and improve the absorption of micronutrients through prebiotic fibers. Improved intake of essential micro- nutrients to the hair bulb . Strengthening the hair structure . Decrease nervous tension and stress. Prebiotic fibers , yeast extracts , sulfur amino acids, extracts of: nettle, grape seed , green tea , blueberry (rich in anthocyanins ) . Vitamins A, C and group B , zinc, silicon. Twice a day , morning and evening , dissolve a tablespoon full well coffee (about 5 g ) in a glass of water or fruit juice. CARPE DIEM 3 acts as an alternative medicine : a course of 3 months is strongly recommended to achieve and stabilize the desired effects. The cure should not be interrupted . 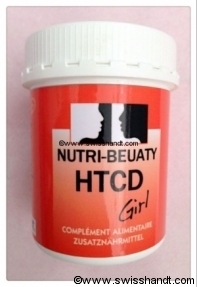 HTCD2 - FOR SKIN REJUVENATION , WATER RETENTION , CIRCULATION, AND CELLULITE . Oxidative stress : the free radicals cause a chain reaction at the cellular level . They are known to be a major cause of tissue aging by degrading collagen , an essential element involved in the appearance of wrinkles . Intestinal dysbiosis ( imbalance and depletion of our intestinal flora ) , among other causes intestinal intoxication , immune insufficiency, dermatological, a fat storage. Water retention : it occurs when the body stores more water than it eliminates . The imbalance results in swelling especially of the legs , ankles and feet. Heavy legs : when the return of blood to the heart is poorly an accumulation of venous blood in the lower most often members can occur , resulting in tissue inflammation. We are talking about venous insufficiency. Cellulite : it is constituted by clusters of subcutaneous fat cells , which hypertrophy , agglomerate and immersed in an inadequately vascularized connective tissue . This implies a densification of collagen fibers surrounding and circulatory stasis , hence the appearance of cellulite . It is situated on the outer thighs , on the inner side of the knees , ankles , on the belly skin and affects 90 % of women to be thin or round . Neutralization of free radicals by antioxidants. Treatment of intestinal dysbiosis : restore intestinal flora and improve the absorption of micronutrients through prebiotic fibers. Restoration of circulation and blood microcirculation. - Slow the aging process of the skin. - Visible decrease retention in legs , ankles and feet . - Improved circulation and blood microcirculation. - Cellulite reduction in the inflammatory phase and fibrosis. Destocking of fats. Prebiotic fibers , extracts of: green tea, pineapple , asparagus, fennel , sage, rosemary, thyme, bitter orange , guarana, grapeseed , bilberry (rich in anthocyanins ) . Vitamins C and Group B. For adolescents and young adults , acne is a real concern aesthetic. Skin treatment alone , proves most insufficient time . Affection banal , but difficult to treat , acne is an expression to the skin of a whole order hépatovésiculaires dysfunction , digestive and hormonal , causing an overproduction of sebum in the hair follicle , which ignites and s' infects . When this set of metabolic dysfunction is not treated causally , acne can evolve over time, to more complex more severe forms . - Restoring the balance of the intestinal ecosystem ( gut flora ) using pre- biotic assets. - Restart detoxification functions of the liver and gallbladder . - Improved elimination and detoxification. - Very significant improvement in the quality of the skin until the disappearance of acne. Gum acacia , acid , citric acid, extracts of artichoke, citrus aurantium , gentian, angelica, chamomile , vitamin C, vitamins b , anti-caking agent silicon dioxide of E551 . Dissolve 1 tablespoon coffee full well (5g ) in a glass of water or fruit juice , morning and evening before meals, for 2 months.